Clinical-stage pharmaceutical firm Cempra has secured orphan drug status from the US Food and Drug Administration (FDA) for its drug candidate Taksta (CEM-102) to treat patients with prosthetic joint infections (PJI). Fusidic acid is a bacteriostatic antibiotic that is often used topically in creams and eyedrops, but may also be given systemically as tablets or injections. The global problem of advancing antimicrobial resistance has led to a renewed interest in its use recently. 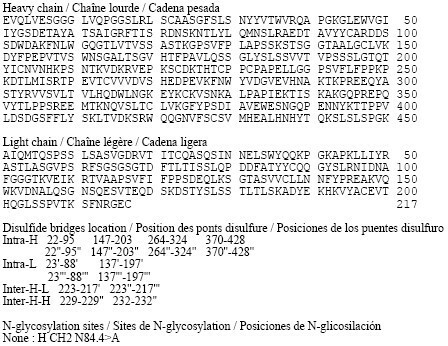 Fusidic acid acts as a bacterial protein synthesis inhibitor by preventing the turnover ofelongation factor G (EF-G) from the ribosome. Fusidic acid is effective primarily ongram-positive bacteria such as Staphylococcus species, Streptococcus species, and Corynebacterium species. Fusidic acid inhibits bacterial replication and does not kill the bacteria, and is therefore termed bacteriostatic. 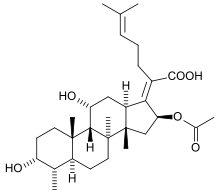 Fusidic acid is a true antibiotic, derived from the fungus Fusidium coccineum and was developed by Leo Laboratories in Ballerup, Denmark and released for clinical use in the 1960s. It has also been isolated from Mucor ramannianus and Isaria kogana. The drug is licensed for use as its sodium salt sodium fusidate, and it is approved for use under prescription in South Korea, Japan, UK, Canada, Europe, Australia, New Zealand, Thailand, India and Taiwan. A different oral dosing regimen, based on the compound’s Pharmacokinetic/pharmacodynamic (PK-PD) profile is in clinical development in the U.S. as Taksta. Fusidic acid (TAKSTATM, CEM-102) is an antibiotic with a long history of safety and efficacy outside the United States. Cempra has exclusive rights to the supply of the compound for the U.S. market. Fusidic acid is orally active against gram-positive bacteria, including all S. aureus strains such as HA-MRSA and CA-MRSA. A novel dosing regimen has been successfully evaluated in a Phase II trial in patients with acute bacterial skin and skin structure infections (aBSSSI). Cempra is conducting a Phase II trial of TAKSTA for patients with prosthetic joint infections. Prosthetic joint infections (PJI) occur in about 1% of hip replacements and 2% of knee replacements, translating to an incidence rate of about 10,000 per year in the U.S. at current hip and knee arthroplasty rates. There are few good options to treat these serious staphylococcal, often MRSA infections, which require long-term antibiotic treatment. Current therapy in the U.S. is with intravenous antibiotics such as vancomycin. An oral drug that can be safely administered for a long period of time could improve care and quality of life for these patients. TAKSTA has shown potent activity against a large number of S. aureus strains, including CA-MRSA, HA-MRSA and linezolid-resistant strains, isolated in the U.S over a 10 year period. Its broad S. aureus coverage makes it useful for a broad range of clinical applications. Because of its safety and tolerability profile, TAKSTA could be ideal for patients suffering from staphylococcal infections that require long-term therapy such as patients with PJIs. Cempra has developed a unique oral loading dose regimen to optimize key pathogen coverage and minimize drug resistance development. This regimen is incorporated in our Phase II trial to treat PJIs with TAKSTA in combination with rifampin, which is commonly used with injectible antibiotics such as vancomycin to treat PJIs. The links for the articles go to subscription-based sites and may require a fee to view the article. Quantitative and qualitative assessment of antibiotic activity against Staphylococcus aureus biofilm. Siala, W., M. P. Mingeot-Leclercq, P. M. Tulkens, and F. Van Bambeke. Abstr. 6th Am. Soc. Microbiol. Conf. Biofilms, abstr A-179. Fusidic acid (FA) is a tetracyclic triterpenoid or fusidane (steroidal) antibiotic derived from the fungus Fusidium coccineum that inhibits bacterial protein synthesis. FA is effective against gram-positive bacteria such as Staphylococcusspecies and Corynebacterium species (L. Verbist, J. Antimicro. Chemo. 25, Suppl. B, 1-5 (1990); A. Bryskier, Fusidic Acid, Chapter 23, in Antimicrobial Agents: Antibacterials and Antifungals (Andre Bryskier, Ed., ASM Press, Washington, USA, 2005)). FA also has moderate activity against Group A beta-hemolytic streptococci, or Streptococcus pyogenes (L. Verbist, J. Antimicro. Chemo. 25, Suppl. B, 1-5 (1990); A. Bryskier, Fusidic Acid, Chapter 23, inAntimicrobial Agents: Antibacterials and Antifungals (Andre Bryskier, Ed., ASM Press, Washington, USA, 2005); Skov et al., Diag. Micro. Infect. Dis. 40:111-116 (2001)). Fusidic acid, chemically (3α, 4α, 8α, 9α, 11α, 13α, 14α, 16α, 17Z)-16-(Acetyloxy)-3,11-dihydroxy-29-nordammara-17(20), 24-dien-21-oic acid, is an antibacterial agent. It is a well-known antibiotic with a unique steroid-like tetracyclic ring system structure, and it is the most potent of a small family of steroidal antibiotics, the fusidanes. It is produced by fermentation under controlled conditions of the fungus Fusidium Coccineum. The excellent distribution in various tissues, low degree of toxicity and allergic reactions and the absence cross-resistance with other clinically used antibiotics has made fusidic acid a highly valuable antibiotic,especially for skin and eye infections. The drug is used clinically both in its acid form, and as the sodium salt (Fusidin®), however Fusidin® is more favored one because of its better solubility in water, enabling a fast absorption from gastro-intestinal tract. As a result, it is more preferable to use sodium salt of fusidin in oral solid forms. 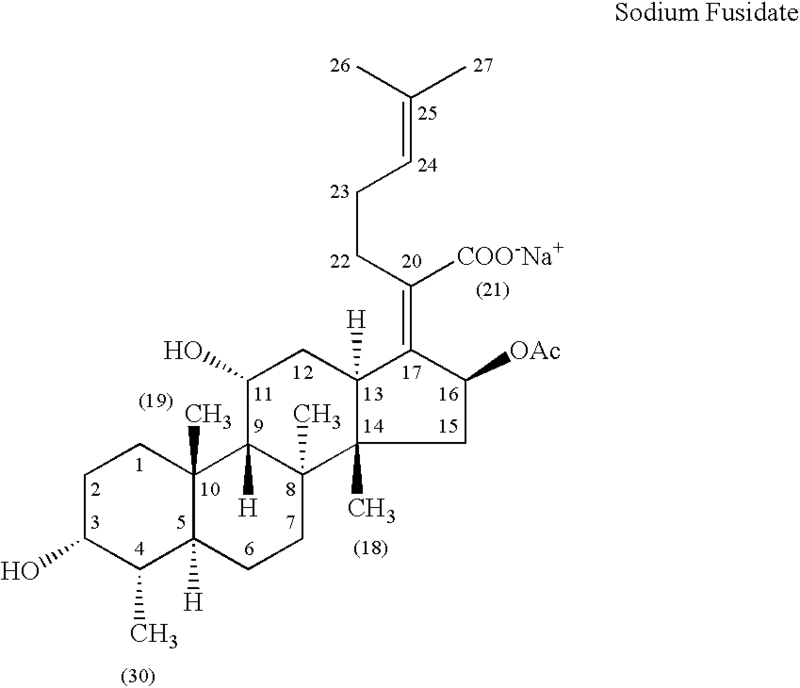 Fusidin® has the actions and uses of fusidic acid, and it has been shown that it ameliorates the course of several organ-specific immuno-inflammatory diseases such as chronic uveitis, Behcet’s disease, type I diabetes mellitus, Guillain-Barre syndrome, hepatitis, sepsis, pancreatitis, formalin-induced edema, multiple sclerosis, and scleroderma, whereby fucidin formulations have a great importance in pharmaceutical production. Fusidin® can be presented in various formulations that differ significantly in their pharmacokinetic behaviors such as oral tablets, oral suspensions, intravenous formulations and topical preparation. Considering oral tablets, many of the early clinical studies were performed with capsule containing sodium fusidate. This was also the formulation marketed for many years in several countries. It is currently available as an oral tablet containing the sodium salt. Originally the sodium salt was available as an enteric-coated form but later it was reformulated as a film-coated tablet that appears to be better tolerated and gives higher blood levels. PCT/WO9603128 A (LEO PHARMACEUTICALS PRODUCTS LTD. ET.AL.) describes the preparation of fusidic acid sodium salt tablets without an enteric coating by using dry granulation method in which a roller compactor was used. The compacted material so produced was size reduced to form a granulate having a bulk density in the range 0.45 to 0.9 g/m3 which was then formed into tablets. FA was developed for clinical use in the 1960s and it is approved for human use outside of the United States, such as in the UK, Canada, Europe, Israel, Australia and New Zealand. It is typically prescribed at doses of 500 mg TID for treating skin and skin structure infections caused by Staphylococcus aureus (A. Bryskier,Fusidic Acid, Chapter 23, in Antimicrobial Agents: Antibacterials and Antifungals(Andre Bryskier, Ed., ASM Press, Washington, USA, 2005); Collignon et al., Int’l J. Antimicrobial Agents 12:S45-S58 (1999); D. Spelman, Int’l J. Antimicrobial Agents 12:S59-S66 (1999)), although some physicians have routinely prescribed the compound at 500 mg BID for treating skin and skin structure infections due to the long half-life of the compound (Fusidic Acid, in Principles and Practice of Infectious Diseases, 6th ed. (Mandell et al. eds., Elsevier, 2006)). Treatment using FA has been well studied and it is generally regarded as safe when administered to humans, as evidenced by the fact that the drug has been in continuous use for more than 40 years. There are, however, several characteristics of FA that have prevented use of the drug against a wider spectrum of bacteria and in the treatment in additional types of infection. For example, approved dosing regimens have been shown to select for bacterial resistance, such as in S. aureus. Approved dosing regimens provide low multiples of the MIC and as a result, S. aureus resistant mutants can be selected after the first day of dosing. Once resistance has developed, FA is not effective against the resistant strains. Resistance is reported to occur if FA is used as a single drug as the resistance frequency at 4 and 8 times the MIC is in the range of 10−6 or 10−8 (Evans et al., J. Clin. Path. 19:555-560 (1966); Hansson et al., J. Mol. Biol.348:939-949 (2005), Jensen et al., Acta Pathol Microbiol Scand. 60:271-284 (1964); Besier et al., Antimicrob. 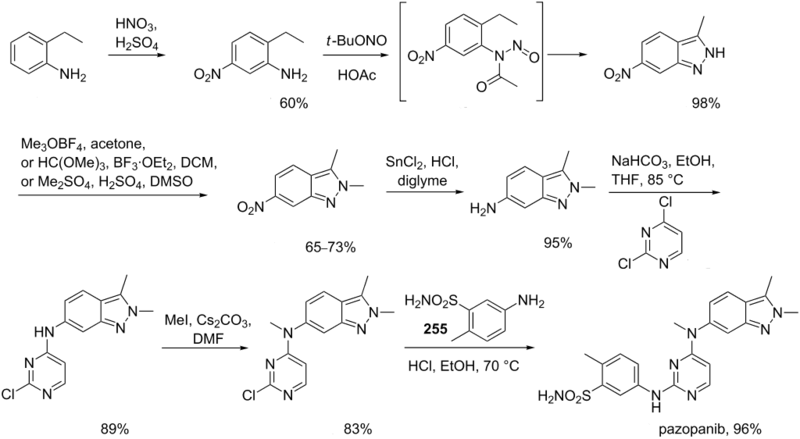 Agents Chemo., 49(4):1426-1431 (2005); Gemmell et al., J. Antimicrobial Chemo. 57:589-608 (2006)). The dosage of the drug cannot be simply increased as a means of avoiding development of resistance. It is difficult to achieve high concentrations of FA in the blood due to the substantial protein binding of the drug (approximately 95-97%) (K. Christiansen, International Journal of Antimicrobial Agents 12:S3-S9 (1999); Coutant et al., Diagn Microbiol Infect Dis 25:9-13 (1996); D. Reeves, J. Antimicrob. Chemo. 20:467-476 (1987); J. Turnidge, Int’l J. Antimicrobial Agents12:S23-S34 (1999); Rieutord et al., Int’l J. Pharmaceutics 119:57-64 (1995)). Moreover, high dosages of FA are not well-tolerated by patients receiving the drug. High doses of FA (e.g., 1 gram TID) are required if the drug is to be used in the treatment of bone and joint infections, less susceptible bacteria and other serious infections. However, treatment regimens using high doses of the drug induce nausea and vomiting and are rejected by patients (Fusidic Acid, inPrinciples and Practice of Infectious Diseases, 6th ed. (Mandell et al. eds., Elsevier, 2006); K. Christiansen, International Journal of Antimicrobial Agents 12:S3-S9 (1999); Nordin et al., Eur. J. Clin. Res. 5:97-106 (1994)). 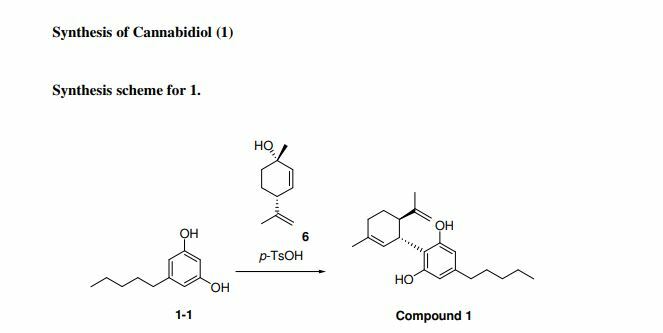 In view of the tremendous costs associated with the de novo development of new anti-bacterials, expanding the indications for drugs that have already been demonstrated to be safe and effective is strongly needed. Overcoming the limitations on the uses of FA would broaden the population of bacterial infections against which it could be used and thus meet this need. In a specific commercial pharmaceutical formulation, fusidic acid is presently marketed [see Monographs in the European Pharmacopeia 5.0] as a hemihydrate, which is the only hemihydrate form which has been described. Patent GB 930,786 discloses salts of fusidic acid with organic and inorganic bases, solvates of fusidic acid, namely a benzene solvate and a methanol solvate. This patent further discloses an unspecified fusidic acid form with IR absorption bands (KBr) at 1265, 1385, 1695, 1730 and 3450 cm“1 and having a specific rotation [α]D 22 of minus 9 degrees (1% solution in CHCI3) obtainable by crystallisation of the methanol solvate of fusidic acid from ether. However, this form is distinct from the form of the present invention evident from the depicted IR spectrum in GB 930,786 which indicates that this form actually corresponds to the presently marketed hemihydrate form. Solvates and salts of fusidic acid have also been disclosed in British patent GB 999,794. Patent ES 2208110 discloses two solvent free crystalline forms offusidic acid called Form I and Form II, and a crystalline hemihydrate called Form III which is identical to the presently marketed hemihydrate, respectively. The crystalline forms were identified and characterised by IR spectroscopy, differential scanning calorimetry, X-ray diffraction and melting points. Patent WO 96/03128 discloses tablets containing a sodium salt form of fusidicacid and WO 86/03966 describes an ophthalmic gel composition comprising an undefined form of suspended fusidic acid. By DR ANTHONY MELVIN CRASTO Ph.D in 0rphan drug status on November 1, 2013 . It really is perfect time for it to produce a very few blueprints for any long run which is time for it to be very glad. I’ve read this post in case I really could I want to advise a person a few exciting things as well as suggestions. You can create following articles regarding this article. My partner and i desire to find out more issues roughly the idea! We have been numerous volunteers along with starting up the latest structure within our group. Your internet-site made available people with valuable data for you to art for. You will have completed an impressive undertaking and also your full group are going to be happy for your requirements. Excellent web-site. Lots of practical details listed here. I will be submitting it to your pals ans in addition spreading within delicious. And obviously, many thanks for your work! I keep listening to the news update speak about receiving free online grant applications so I have been looking around for the most excellent site to get one. Could you tell me please, where could i acquire some? Hi cool website! Man. Fantastic. Great. I am going to take note of your website plus make for also? My business is happy to search for a number of handy data the following from the distribute, we want work out extra methods about this value, thanks for revealing. It’s as if you study my thoughts! You appear to learn considerably roughly this particular, just like you authored the publication in it or something like that. I feel that you simply could possibly use several p. h. to force the content home somewhat, even so apart from that, that may be outstanding website. An excellent understand. I’ll be again. Are You Struggling To Make Resources Online? Uncover how you can buildup your sales, traffic and crush your competition by installing 11 authoritative and underused WordPress plugins. Warning: Do NOT use WordPress without these essential plugins. I do not also recognize how I actually finished up below, but I thought this post was superior. I wouldn’t realize who you really are having said that unquestionably you are likely to any famed digg if you are not by now. Best wishes! You now know as a result appreciably in regards to this subject, manufactured everyone in my opinion accept it as true out of a lot of varied angles. Their for instance men and women are usually not fascinated until finally it’s something to achieve by using Gal coo! Your personal products exceptional. Often care for this! You now know as a result appreciably in regards to this subject, manufactured everyone in my opinion accept it as true out of a lot of varied angles. Their for instance men and women are usually not fascinated until finally it’s something to achieve by using Gal coo! Your personal products exceptional. Often care for this! Do you know what year specifically in the 1960s Leo Pharma launched fucithalmic? And what year did that patent expire?